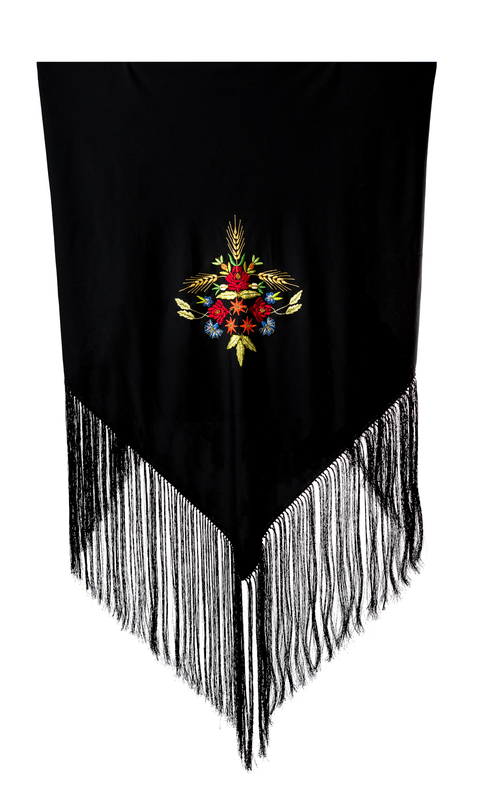 This elegant shawl, element of the traditional Sardinian costume, is made of light tibet wool, it is embroidered with vibrant polychrome silk thread and finished with a long decorative fringe. 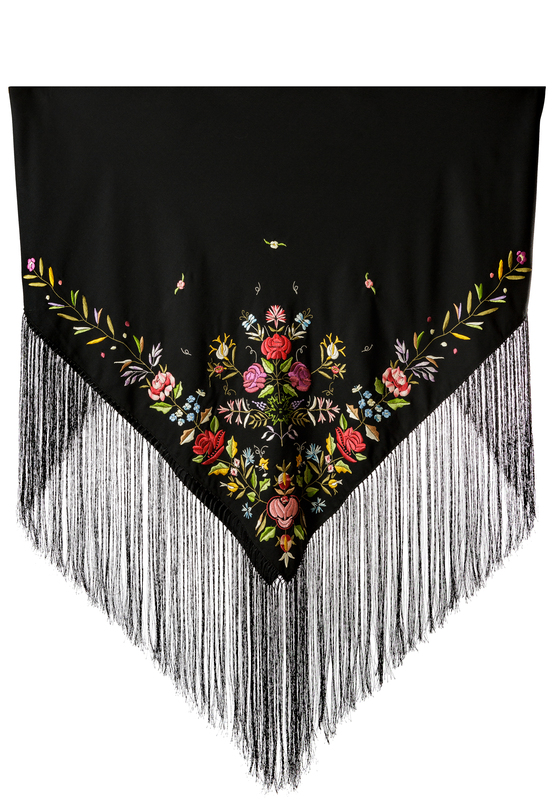 This elegant black tibet wool shawl is richly embroidered with garlands and ears of corn, symbolising fertility, drawn on the traditional feminine costume for special occasions. 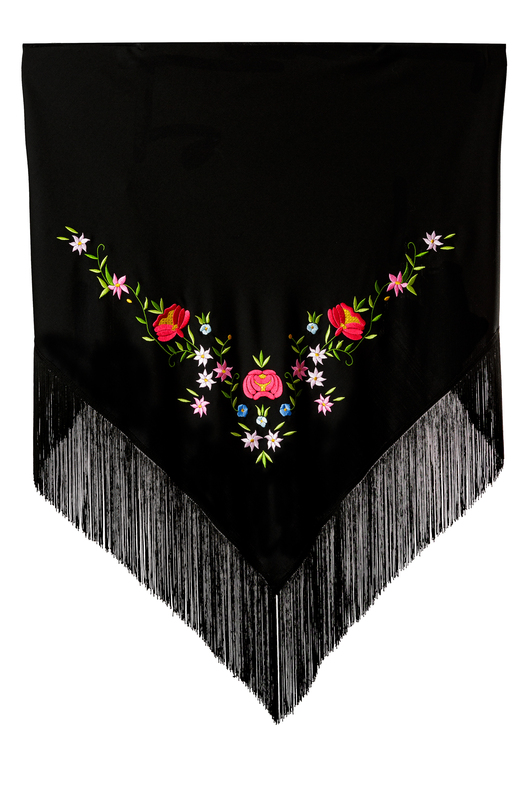 The design of an antique piece of embroidery is reproduced on this large black tibet wool shawl with rich floral motifs of roses, bunches of grapes and pomegranates, well-wishing symbols of the Sardinian tradition. The traditional Sardinian costume, renowned for its variety of styles, fabrics, techniques and colours is the multifaceted sector Luisella Fenu has specialised in, with her thirty-five year-long experience. Her exquisite production of traditional costumes is especially characterised by the polychrome decorative embroidery that she realises on the large black scenographic shawls: a faithful reproduction of the ancient tradition of the Campidano region. Highly talented and interested in tailoring and embroidery, Luisella Fenu learned the traditional techniques when she was very young, keenly observing and working with her grandmother, an expert embroiderer. In 2000 she set up her own activity, Atelier les prècieux, carrying on the study of the traditional costume and embroidery techniques, developing customised procedures also with the use of new technologies. She promotes her tailoring and products with sincere enthusiasm by participating in the major trade fair events in the sector, both at the local and national scale, and by using the modern e-commerce platforms. 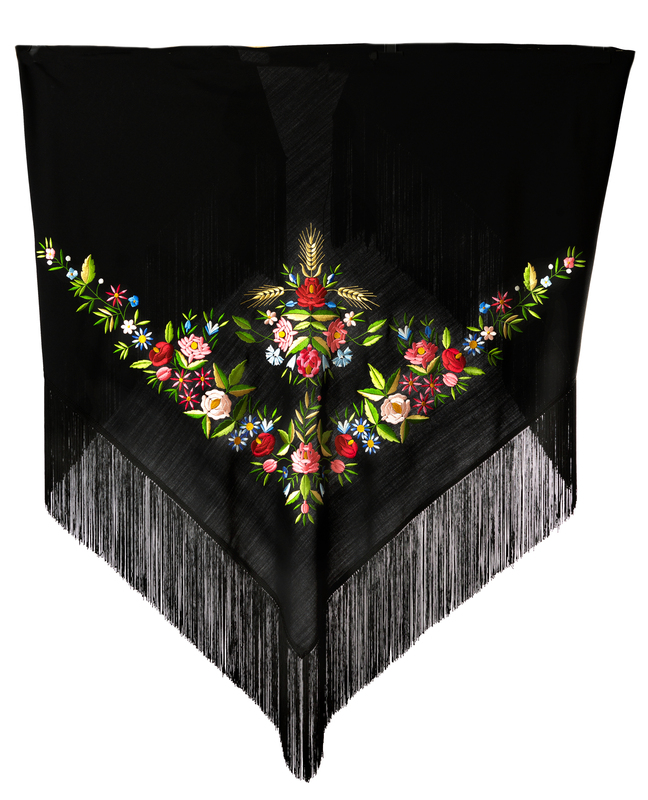 The line of large black wool tibet shawls with polychrome embroidery is the distinctive feature of Luisella Fenu’s tailoring. Drawing on tradition, her large shawls take on a contemporary value, becoming elegant garments for women, a sought-after element of prestige. 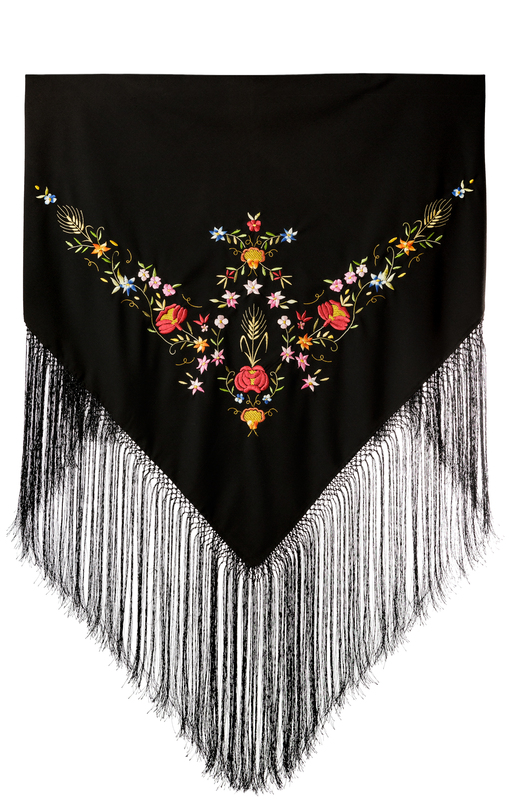 Hand-embroidered or with the aid of new technological tools, the line of shawls derives from the production of tailor-made clothes: faithful reproductions of traditional Sardinian costumes, studied and realised individually, finely reviving the style and the remarkable variations that characterise each town or village. Bodices, bustiers, boleros and jackets, embroidered blouses and the complex pleated skirts are crafted with skill and technical fidelity. In Lusella Fenu’s tailor shop, the highest quality woollen tibet shawls are embroidered entirely by hand, with long, hand-knotted fringes, but they are also available at a lower price in the case of partial or total machine-embroideries to which fringes are then added. The traditional costume is entirely handcrafted, starting from the preliminary design of the pattern, based on the study of the traditional costume, through the careful selection of fabrics, cutting, tailoring, and the accurate finishing touches.